A Pair of Puffins, an acrylic painting (8×10) was done on canvas paper using mainly Golden and Liquitex brands. This piece was painted as a possible candidate for a women’s/children’s benefit auction. Puffins have the most sweet / cute personalities of all bird species – actually pretty comical to watch. In the U.S. they are found mainly along the coast of Northern Maine. On the internet there are live cam’s that have been placed on Sea Island, Maine that let you watch in prime time. I found several exceptional photographs on pmp that I used as a reference to paint these little guys. Another different subject for me to paint, but one that I thoroughly enjoyed working on. Thanks for visiting – click onto the image for a larger view. Please don’t take my images – my art is copyrighted. Please don’t copy or use the image without receiving my permission first – see disclosure on the right panel. 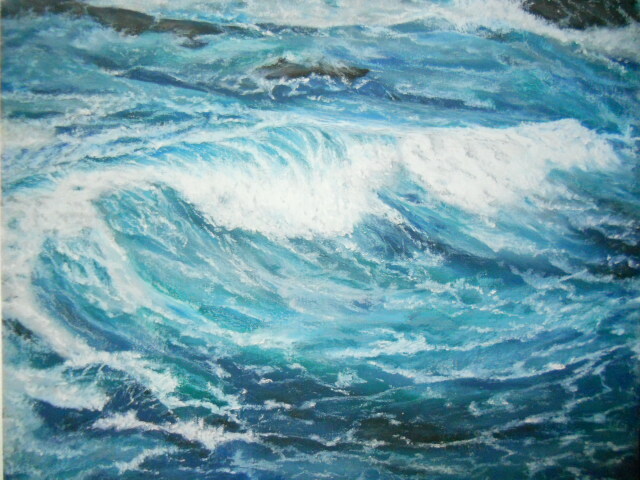 This entry was posted in Acrylic Paintings and tagged acrylics, art, birds, fine art, painting, puffins, Sea. Bookmark the permalink. I love this!! Beautiful and I agree. I want to try to paint the Puffins some day. Very nice job. Wonderful to meet you Leah . thank you for visiting and leaving such a nice comment . I hope you paint puffins, they have a great personality to capture . Wonderful to meet you also Mary. I’ve watched countless live cams, they are amazing little sea birds – very animated and cute. 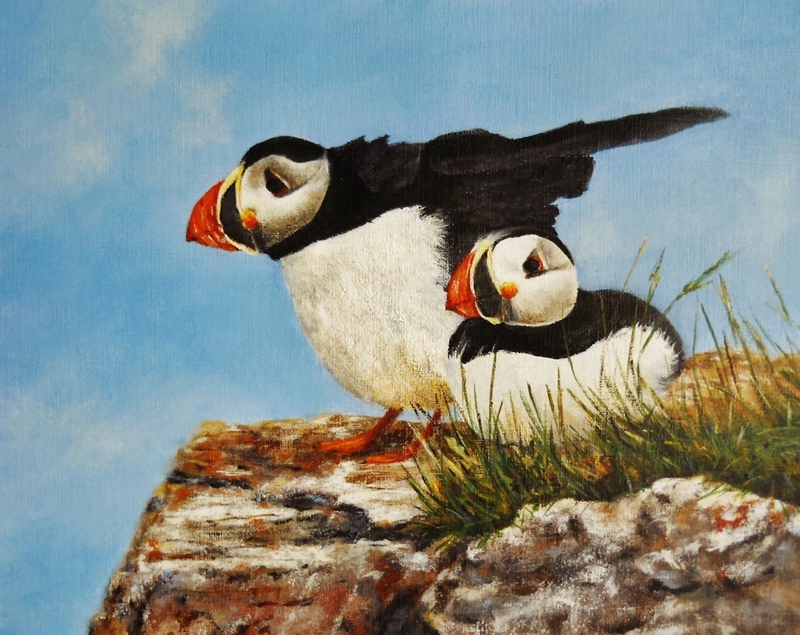 I love looking at puffins and this is a lovely painting. I’ve never seen one in ‘real life’ but so nice to see photos and your painting of them. Thank you so much Val for your lovely response to the painting. Seal Island has several live web cams and you can watch these little buys 24/7 – cute with tons of personalities. Thank you for being so generous in your comment. Very much appreciated! Thank you Mani, much appreciated for your visit and comment! Hi Jet, so good to see you again. Thank you for your generous feedback – Puffins are personality plus. I really appreciate hearing from you – hope you are well. That is absolutely beautiful, Mary! Well done! So good to see you Cynthia – thank you for your generous comment. I really appreciate it. Great job with the painting!! Thank you Esmee for your comment and visit – glad you enjoyed the painting. The comment queue illustrates that this is a well-loved painting! I loved that blue which contrasts so lovely with the black and white of the adorable puffinns! Most of all, I always smile when I read your final sentence about not stealing your art. You’ve found a good way to state your rights, and you did it with style! So good to hear from you Lisa – I hope you are well and almost ready for your exhibition. The patrons will be wow’d by your work, no doubt. Thank you always for being so generous and gracious with your words of encouragement and support ~ you are a dear friend. Wonderful to see you Pauline – thank you for your kind words. Glad you enjoyed the painting. Nice painting of Puffins. I know they are also found in Newfoundland. Thank you Shawn, you are so right they grace the northern Atlantic coastlines. A fun bird to watch. Always appreciate your feedback, thanks again. So funny Judy! Glad you like the puffins they were perfect to paint for this project. Love your response ! Awesome Resa so happy you enjoy this painting. You have made my evening and I am smiling . Puffins are the cutest ever. Thank you my friend , love you too ! You have now!! 😀 Puffins are sooo beautiful, and you have done them justice! You know it June . going up north next week to see mom – can’t wait. Thank you for your comment, guess what? This is one of the paintings I did for a charity auction that Mary is doing in November. They decided on another of my paintings that I will post when I get back. Take care, love you too. Lovely Mary! Puffins are so cute. Seeing your painting reminds me how much I miss Maine. Beautiful work as always. Great to see you Catherine, thank you so much. Besides lobsters, puffins are special to the State. I am with you, miss the place . Good morning Uncle John, thanks very much for your encouragement and support – appreciate your generous comment. Thank you my friend, glad you enjoyed the piece. Thank you Rose Elaine ~ I really appreciate it. Thanks Derrick – always appreciated! Oh wow, Mary….they’re adorable! I love it! Thanks so much for sharing. Thanks Jill – it is very hard not to fall in love with these birds. Glad you enjoyed the painting. Thank you Marion. They are the cutest birds. I have watched the live cam and sometimes there is a whole flock of them talking to each other and you got to wonder what they could possibly be saying! You have captured their personalities in your painting, Mary. Thanks Gallivanta, precious they are ~ hope you are enjoying your Spring weather. Your flowers should be blooming soon. Mary, they’re adorable. Sweet yet jaunty. Thanks so much Patricia – hard to resist them!! I bet you had fun painting the puffins!